Beth Marx may go by JP Beth which stands for “Just Plain Beth,” but anyone who’s ever met her will tell you that she is anything but. 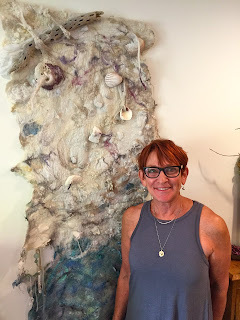 In love with fiber arts, textiles, creating jewelry, her dogs, and the world as viewed from the cockpit of a plane, Beth is one of those uplifting souls whose unique texture is tangible throughout her many creations. Her abiding love for unexpected combinations expresses itself with the layering of colors, fabrics, flavors, and décor – combining the old with the new, the elegant with the edgy, the spicy with the sweet, and the simple with the bold. 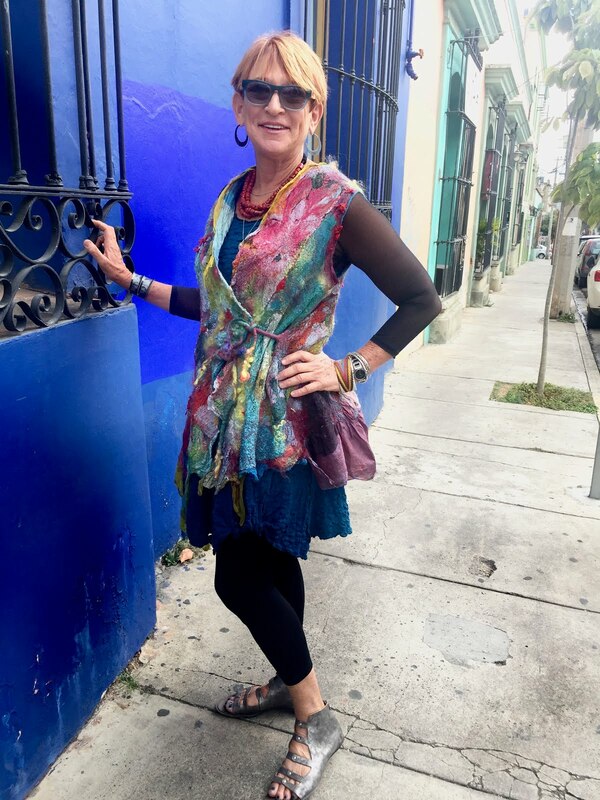 Studio 907, affectionately dubbed for its uptown address, is the colorful and cozy 1920's California bungalow where Beth Marx lives, designs and creates one-of-a-kind jewelry, accessories and wearable art. Beth finds balance working with hard metal and soft felt often creating a single piece using both medium like the etched metal closures on her nuno felted purses or the felted beads adorning her hand forged wire necklaces. Her process is organic and intuitive, allowing her creations to evolve like a collage. 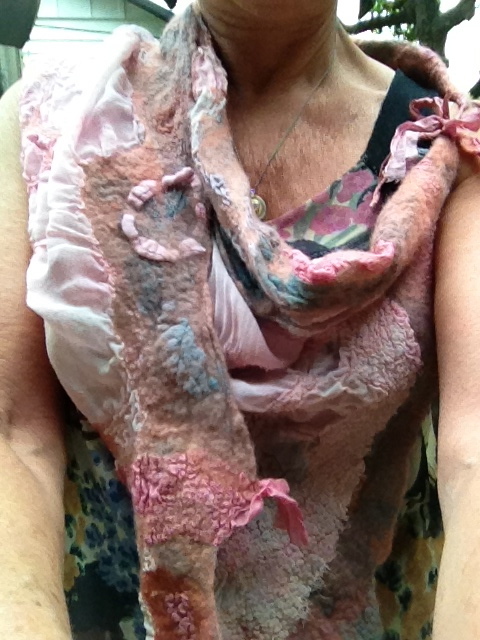 She repurposes cast-off items, integrating found and worn treasures into her work. 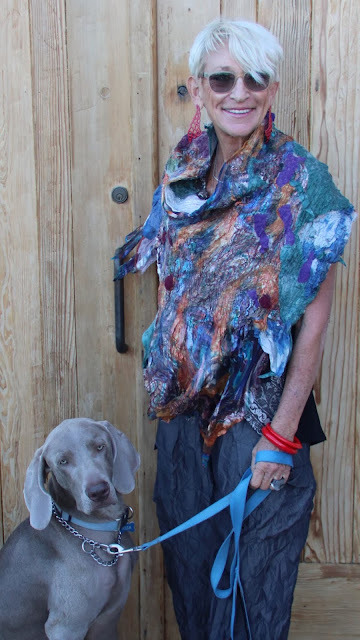 Whether she is manipulating metal with hammer, anvil and fire to create a unique piece of Boho jewelry, or teasing wool fibers and fabric with water to create a piece of nuno felt, Beth’s style always exudes an earthy patina rich with tactile, textured layers. Blessed with fierce optimism and heart-healthy resilience, Beth has weathered storms in her life, but like the traveling she loves to do with her boyfriend Joe in his private plane (lucky girl! ), it’s in her nature to rise above the storm. She's knit her way across the skies to many exciting destinations -- Africa, Australia, Spain, Mexico, Alaska, the Caribbean and some with her three dogs Juma, Tucker and Oliver. Beth makes for a nimble navigator and a contented co-pilot. Look for their plane – it’ll be the one trailing the yarn! Long Beach never FELT so good!